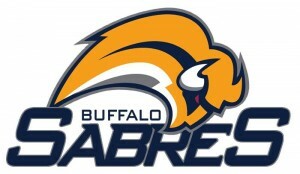 What’s gotten into the Buffalo Sabres? Last year’s NHL doormats have suddenly sprung to life as the league’s hottest team heading into the second quarter of the season by riding an eight-game winning streak, including several come-from-behind victories. This is something the team’s youngest fans have never experienced before as the last time the club ran off eight consecutive victories was at the beginning of the 2006/07 campaign when they reeled off 10 straight. So why the turnaround? Well, there are a couple of major reasons the Sabres flying so high in the standings. The club can be thankful for winning the NHL Entry Draft lottery last year as the Edmonton Oilers didn’t pick first for a change. Sabres’ GM Jason Botterill didn’t have to think twice by taking 18-year-old Swedish defenseman Rasmus Dahlin to kick off the proceedings. And owning the first-overall draft pick can do wonders for a struggling team. Just look at the Toronto Maple Leafs and Auston Matthews. But as well as selecting the top pick this summer let’s not forget the Sabres also had the second-overall selection three years earlier. The Buffalo Sabres are still searching for their first Stanley Cup Championship. It’s an interesting time to be in Buffalo. For so long, we’ve depended on our sports teams to give us some shred of validation, since we’ve been known to the world for blight, blizzards and chicken wings, whose hot sauce is curiously the same shade as the rust on the infamous Rust Belt, by which we have often been defined. More recently there have been some signs of life in Buffalo. Some say a renaissance is beginning to break out. The National Trust for Historic Preservation recently concluded their most successful and best attended convention, here in Buffalo. The draw was the fact that Buffalo has more turn of the century architecture preserved than any major city in North America. Further, other than Chicago, Buffalo is the only city to have signature buildings designed by all four of the first generation of great American architects: Frank Lloyd Wright, Daniel Burnham, Louis Sullivan and H. H. Richardson. At least two major architectural landmarks downtown—Hotel Statler, and Hotel Lafayette– have been saved from the wrecking ball by visionary developers, and are being restored to their original opulence. Buffalo is beginning to garner great reviews in travel sections of such cosmopolitan papers as the New York Times and the Toronto Star. Suddenly the rest of the world is beginning to discover and appreciate Buffalo’s cultural environment which is, in size, scope, diversity and quality, comparable to places like Chicago or Boston. And by “cultural environment,” I mean more than 20 professional theater companies, a world renowned symphony, two world class art museums, a plethora of notable restaurants, extraordinary boutique shopping, distinctive galleries, as well as more than 20 colleges and universities. Buffalo has been a relative refuge from the global economic downturn. Housing values have continued modest appreciation. Unemployment remains at least a point below the national average’ and private sector employment remains strong. Unfortunately, the one thing Buffalonians have depended on for a sense of purpose and validation, the Buffalo Sabres and Bills—especially the Bills– have been in decline. And despite all the other signs of regeneration in Buffalo, that still hurts, because the true religion in Buffalo is its sports teams. The Buffalo Sabres need a spark to help them stop getting squeezed by the rest of the NHL. 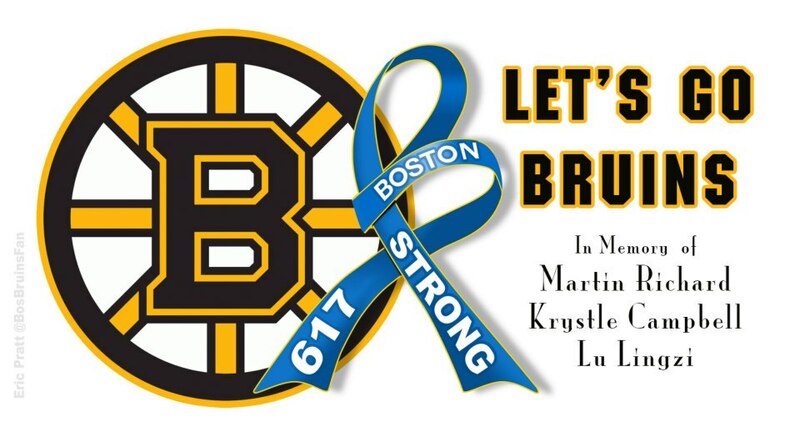 I’ve come to enjoy tweeting with my social media peeps while watching Buffalo Sabres games. Whether I’m at HSBC Arena or watching on TV, it is the next best thing to sitting with a group of friends while watching the action. As the Sabres slowly let the air out of a 2-0 first period lead on Philadelphia, eventually losing 5-2, last night, more than one of my friends tweeted, “Save us Pegula!” Pegula being billionaire Terry Pegula, rumored to be on the verge of purchasing the Sabres from Paychex mogul, Tom Golisano, for a reported $175 million. We’ve been hearing that a deal is imminent for a while now, while minority owner and managing partner, Larry Quinn continues to repeat catty non-denial denials, but reports persist. Yesterday Sabres officials confirmed that Mr. Pegula was in Buffalo, in “informal talks” at the Sabres front office, “kicking the tires,” as one report put it, on his putative acquisition, and rumors of Pegula sightings were rampant on Twitter during last night’s game. 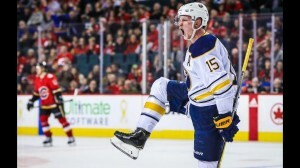 The Sabres began this past week with an overtime win against Toronto. The Maple Leafs continue to struggle against the Buffalo Sabres, losing the last nine matchups. Toronto did have a 2-1 lead in the 3rd, but the Sabres tied it up and eventually won the game in overtime. 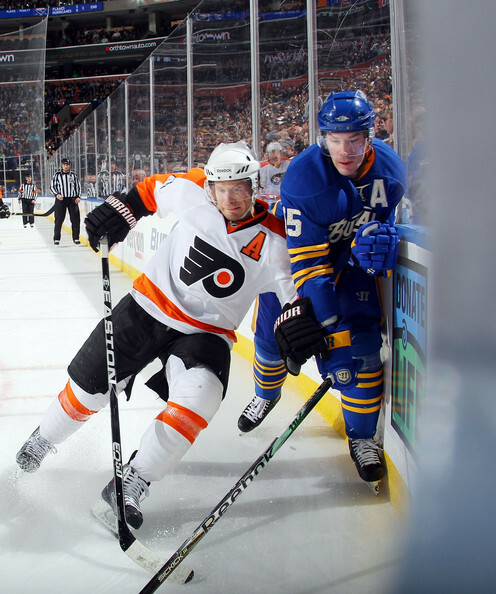 Buffalo was without Thomas Vanek and Patrick Kaleta, who were both recovering from injuries. About midway through the third period, Jochen Hecht tipped in a rebound pass Jonas Gustavsson to tie the game at two. 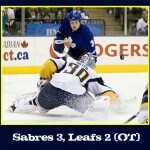 Toronto played very well, and deserved the win, but they were unable to stop the Sabres. Derek Roy took a pass from Hecht, and backhanded it into the net for the overtime win. On Wednesday, the Sabres ran into the Washington Capitals and found out how good they really are. 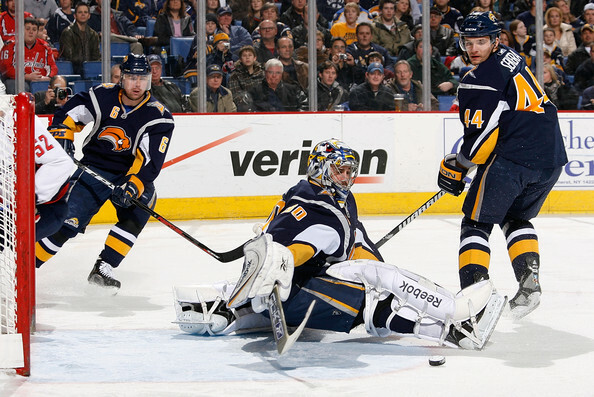 The Sabres have held the Capitals to just two goals in as many games prior to Wednesday. Buffalo stayed with Washington for most of the game, but then collapsed midway through the third. In the third, Washington would take advantage of a 5 on 3 power play, scoring twice. Backstrom scored his second of the night, followed by an Ovechkin goal to break the game wide open. The Sabres stayed in the game up until the two man advantage for Washington. The Capitals have led in 35 of 37 games this season.